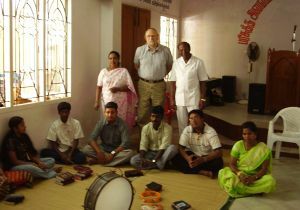 Dr. P and Vasantha Paramanandam, in Chennai, India, hosted Mike Banta in their church in February. Mike, a businessman who travels to India from time to time, is also a musician with Don and Wendy Francisco's Rocky Mountain Ministries and partners with Dave and Bonnie Duell's church, Faith Ministries Church International. Mike spoke on Luke 19:1-10 (Zaccheus), and six Hindu ladies were saved! Please visit to our ministries web site:www.irgm.org, and pray for our indian village ministries.